BUCKSPORT, Maine — With a recent visit from a Norwegian cruise ship, Bucksport realized a goal — to become a scheduled destination for foreign cruise ships. The Hurtigruten Group’s MS Fram became the first international cruise ship to visit Bucksport on a scheduled stop Oct. 18. Some 90 passengers disembarked, visiting downtown and nearby Fort Knox. Foreign ships have come to Bucksport before, but only in bad weather or when scheduled destinations were overcrowded, harbor master Michael Ormsby said. The ship’s visit complements other town efforts to diversify its economy since Bucksport’s paper mill closed in 2014. Town officials will start pitching Bucksport to major cruise lines this winter, said Richard Rotella, the town’s economic development director. The virtually unconditional welcome mat for cruise ships puts Bucksport at odds with several other communities in the state. Rockland has limited cruise ships to six visits per year while the city develops a long-term harbor management plan. Several Mount Desert Island towns have banned cruise ship traffic altogether. Bar Harbor is working on managing congestion from cruise-ship passenger pedestrians and tourist buses. Bucksport has a long way to go before its cruise ship traffic will rival that of other towns. Bar Harbor has 180 scheduled cruise ship stops this year, and Portland has 118 before the tourist season ends next month, according to their websites. 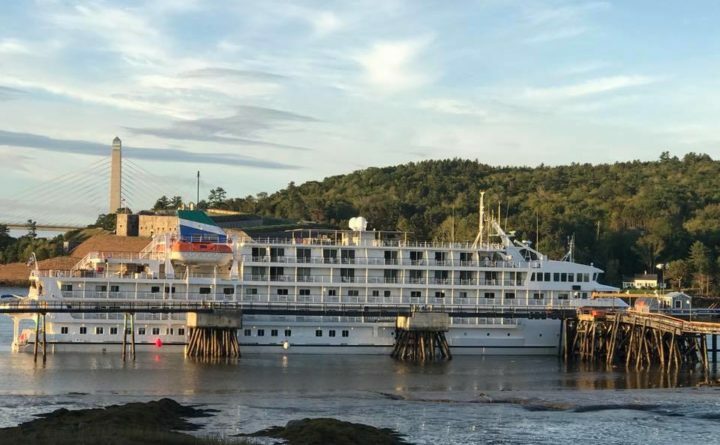 The Fram didn’t send passengers to Acadia, but during an unscheduled stop in September 2017 by another cruise liner, the Pearl Mist, 200 tourists visited Acadia. Another 50 passengers elected to visit Bucksport, Ormsby said. Ormsby expects that the town will make money from all of its cruise ship landings, even when passengers use Bucksport mainly as a bus stop. The town charges cruise ships $2 per foot of ship length as docking fees. The Fram is 374 feet and Pearl Mist is 325 — small vessels compared with the largest that visit Bar Harbor or Portland, but still good-sized, Ormsby said. The Pearl Mist visit gave town officials a chance to test a workaround that allows large cruise ships to berth in town. American law prohibits foreign cruise ships and tenders from docking at unfenced facilities in the U.S., so the owners of the mill site allowed the Pearl Mist to stop at their oil dock, which is fenced, Rotella said. The Fram, meanwhile, used an American tender, the Equinox out of Camden, to transport its passengers to the town dock, Ormsby said. Rotella said he hopes Bucksport complements, rather than competes with, other Maine towns as it angles for cruise ship traffic.